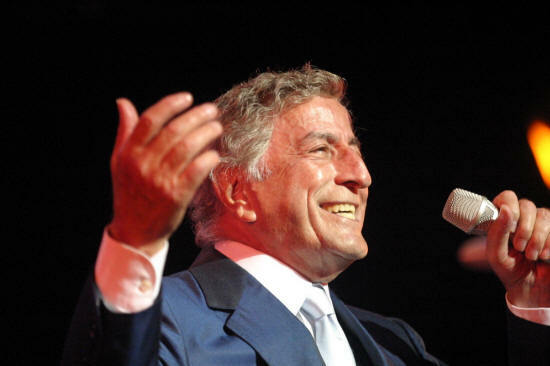 Tony Bennett belts out "I left my heart in San Francisco". NO Tony NO! - Webmaster Doug didn't lose his HEART in San Francisco, he lost his #@&^%*$ PHONE in San Francisco. ALONG with all his 100+ reunion pictures. In retrospect, the always too busy engineer had the two previous years to set up all pictures to automatically be saved to the CLOUD and he DIDN'T. Tuesday May 2nd - His run up and down to complete the "3 Dunes Challenge" at the Indiana State Dunes in the cold and biting wind (got some great pictures!) Also a family dinner that night at El Taco Real in Hammond. Wednesday May 3rd - His visit with his two favorite cousins Bob and Joyce & their spouses to visit our other cousins Rita, 85 and MaryAnn, 82 in Joliet. Plus MaryAnn's youngest daughter Barbara, 37, who has run 12 marathons now, came special to meet geezer Doug. Barb is the youngest of 10 of Tom and MaryAnn's children. 27 grandkids already and untold greats. My buddy Tom even whipped out a couple of brass hand grinder cutoff wheel adapters for me on his basement lathe (Makita, Home Depot and even Amazon didn't carry them!). Thursday May 4th - 5 of us (my cousins and their spouses) visited Fair Oaks Dairy Farm in Indiana including the Birthing Barn where you get stadium seating between 80 and 100 calves barn everyday. The elementary school kids in the terraced seating were mesmerized! Lots more there to see than just that too. After later touring the pig & piglets section of the farm we went and enjoyed a yummy bacon sandwich at their COWfe'. That night was pizza & beer at Aurelia's Pizza in Homewood. Owner Joe Aurelia bought us a round of drinks too. Friday May 5th - Drive to Chicago. Pick up Jerry Levine. We drive to Montrose Beach to wait and see if any SSHS cyclists showed up for the ride. As we suspected too cold and windy for ANYONE. Drove by Wrigley Field (Whoo Hoo - always more pictures) on the way to pick up my old U of I aerospace engineering buddy, Wayne Madsen PhD (and later roommate in California while going to Stanford) before heading to Navy Pier and Margaritaville (took a bunch of pictures there!) Then to drop off my luggage at the Wyndham Grand Riverfront Hotel, drop off Jerry then Wayne and then head to O'Hare to pick up my wife Karen, who was arriving at 4:30 PM. Met her after dropping off the rental car. We hopped the CTA to to downtown Chicago. Just a few block walk with just her luggage to the Wyndham. Happy hour at Hoyt's. Sunday May 7th - Met with Denny and Fay Flanzer. We all had breakfast at the famous Billy Goat Tavern on Michigan Avenue. Kind of an old dump, but great people & great history. The 4 of us then walked down along the Chicago River trail to Lake Shore Drive (of course, more pictures) before turning back. 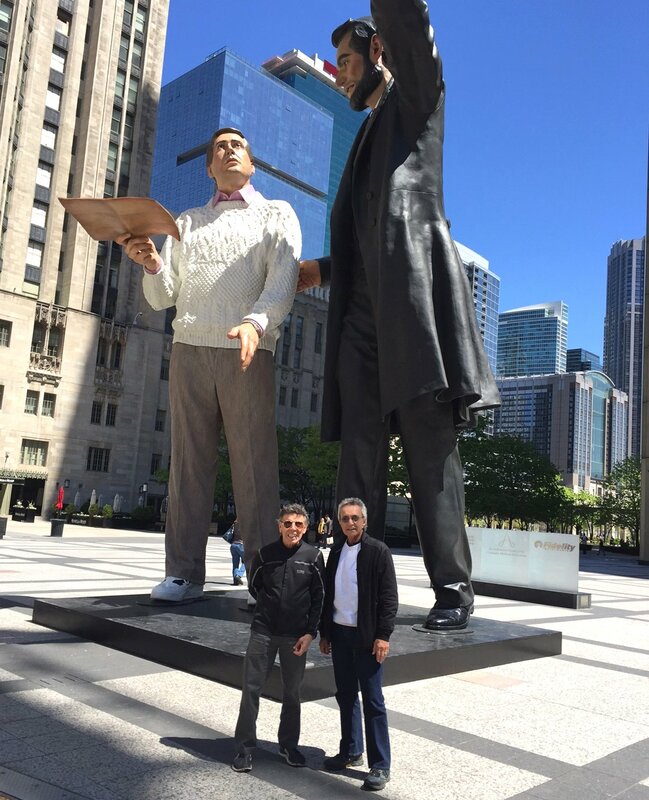 Denny sent me this picture of us at the Lincoln statue on Michigan Avenue. That night the 4 of us used LYFT to get to the official 60th reunion party at Trattoria in Evanston. Wayne Madsen drove us back to our respective hotels. Monday May 8th - After coffee and bagels at the nearby Corner bakery, Karen and I walked with our luggage in tow all along Wacker Drive to the Amtrak Union Station to catch the California Zephyr to San Francisco. Lots more fun in SF. THEN... probably in the Bart Station on Saturday May 13th (when we were heading to the SFO airport to come home) is when my phone disappeared. Lost a lot more pictures than the 100+ I took at the reunion events #@!*&%^*&. Such as: on the train along the Colorado River, crossing up and over Donner Pass (still lots of beautiful snow). Fisherman's Wharf & Pier 39, China Town, up at Coit Tower, Golden Gate Park's De Young Museum, the Legion of Honors Museum, Cafe' Claude, the Mechanical Engineer Society's library. To be depressed or not to be depressed? That is the question! If you took ANY photos with and of classmates at our 60th reunion please send to DMalewicki@cox.net, so we can at least post a few. Thanks.